Grady W. Roberts has spent his entire 28 year career in the real estate industry. After graduating from the University of Texas at Austin, he spent 19 years at HFF, L.P., a publicly traded commercial real estate brokerage and investment banking firm. 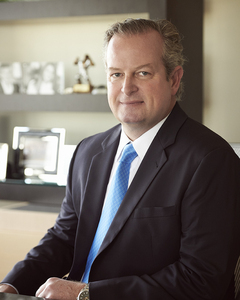 Mr. Roberts played multiple roles for the company including Senior Managing Director and Co-Head of the Houston office. During his tenure, the office generated $41.4 billion in real estate transactions. As a producer, Mr. Roberts financed office and multi-family properties in 39 cities and 21 states across the U.S.A. This includes more than 50,000 multi-family units in both debt and equity transactions. Mr. Roberts is also founder and principal of GWR Equites, LLC; a multifamily investment firm in Houston, Texas. The firm focuses on acquisitions located near existing and emerging business sectors in targeted cities. Since the firm’s inception, 29 properties have been acquired with more than 6,500 units in Texas, Alabama, North Carolina and South Carolina. Mr. Roberts, a native of San Antonio, has lived in Houston since 1991. He is a member of The University of Texas School of Undergraduate Studies Advisory Council. He is married and has four children, two daughters and two sons.